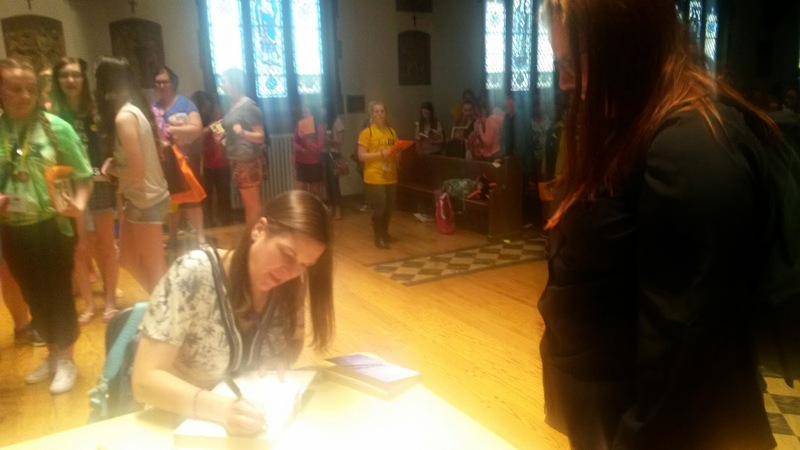 So yesterday, I drove from my house in Canada to Rochester, New York for the Teen Book Festival at Nazareth College. 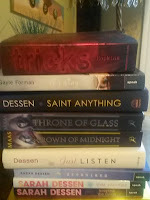 I specifically went for Sarah Dessen because this was the closest her book tour for Saint Anything was getting to me. Needless to say, I was ecstatic because I have been reading her books for almost 9 years now (gosh I'm old) and I had burning questions about Just Listen and my lovely Annabel Greene, so I rolled my old body out of bed at 5:00a.m. and started the trek across the border. I brought along my dad and his best friend so they could explore the city of Rochester because I didn't want to drive that far on my own. I brought along 10 books by 4 different authors to get signed because I hate my back (also it is very sore today, I have kinks in my neck and want to cry). 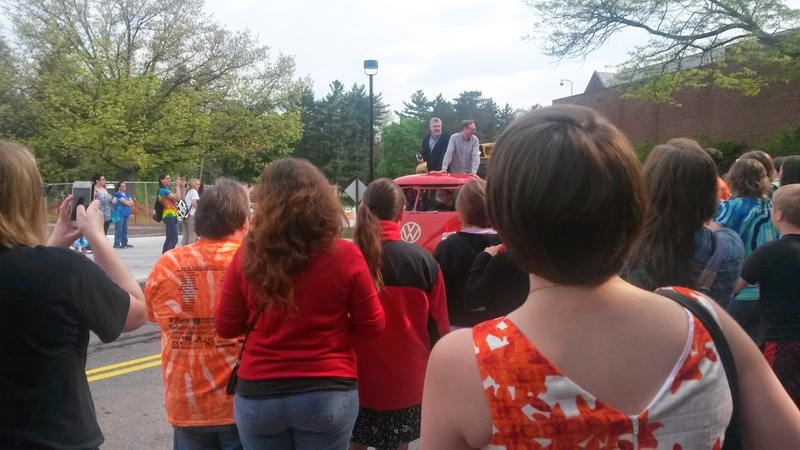 I arrived to Nazareth College for the Author Parade and it was so cute. 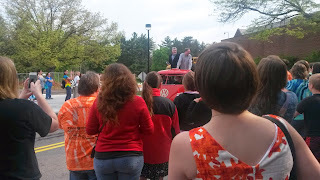 The authors all sat on this little red Volkswagon truck to come up to the red carpet before entering. 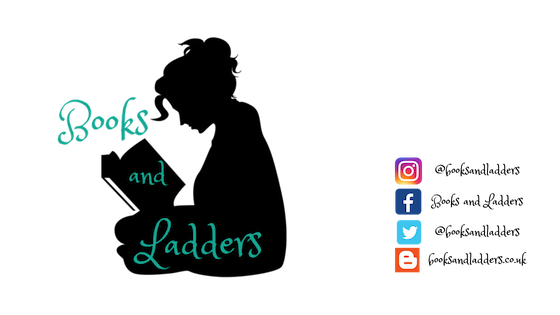 I then entered and sat with the crowd listening to the band that played before the authors were introduced as everyone assembled and bought books from the vendors that were there. The authors were introduced and they played a game called "Truth or Talent" where the authors had to either tell a truth about themselves or show off one of their talents. 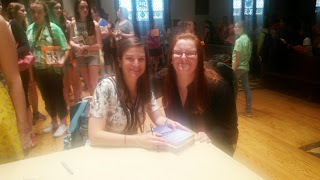 (Gayle Forman's talent was delegating and her beautiful daughter did a gymnastics move for us that was extremely impressive) But since I was there for Sarah Dessen, I payed closest attention to hers. She told a truth about herself in high school and how she was always in trouble and not on the right path. I think it was wonderful because she told the crowd about how the principal asked if she was related to her older brother and when she replied yes, she was tsked at. She told the audience (which was comprised of very young adults -- I was closer in age to the chaperones than the other attendees and had a mini quarter-life crisis) that it is okay if you don't know where you are right now or don't know exactly where you are going because there is still time to figure all that out in the future. I think this is SO IMPORTANT and something that would have really resonated with me as a teen since I had a semi-direction of where I wanted to go but not a set plan. 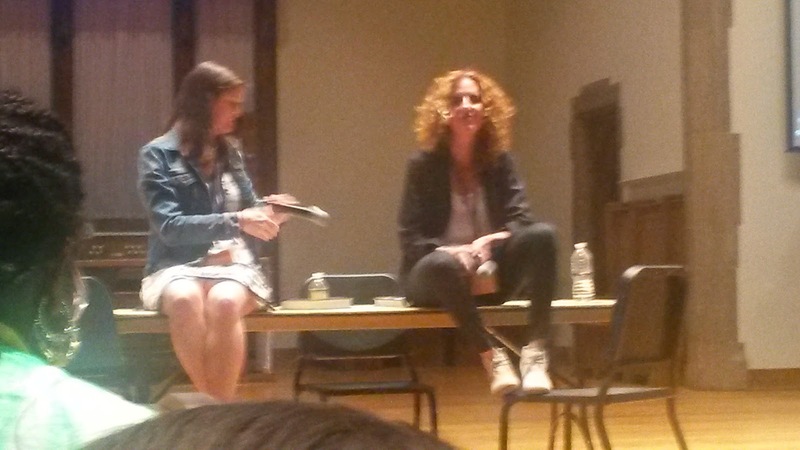 I then went to the first two panels that she had with Gayle Forman. For the first, I sat at the back and a lot of the questions were related to Gayle Forman and her books and experiences (IN WHICH SHE SAID SHE COULDN'T GIVE OUT ANY INFORMATION ABOUT A "WHERE SHE WENT" MOVIE WHICH BASICALLY MEANS THERE WILL BE A WHERE SHE WENT MOVIE). So I stayed behind for the second panel and sat closer to the front so that I could see and hear what was happening. I asked a question (!!! "What is the other half of Annabel's (from Just Listen) "or not" quote?" because I NEED TO KNOW) but she did not have an answer and said she hadn't really thought about it (which saddened me but omg I talked to Sarah Dessen). She then went on to talk about how she wrote a certain character in Saint Anything to be especially creepy because that is typically the type of guy you encounter. Gayle chimed in with how a lot of her characters aren't particularly villains -- except Will Cash, but that didn't mean that this character wasn't creepy or unsettling in his own right. Then she went on to say how, especially in the Southern United States, girls are told to be nice and polite and not upset anyone, so when things like creepy men and their behaviours happen, they don't know how to respond correctly. And this was also SO IMPORTANT because I would say 90% of the people in that room were young girls who have most definitely encountered someone who has made a pass or an inappropriate comment and didn't know how to respond so they just giggled or waved it off. I used to be like that but I am older and have had this experience happen to me a lot and know now that you tell people when you feel uncomfortable, but I wish someone had thought to tell me that it was okay to do that when I was younger. 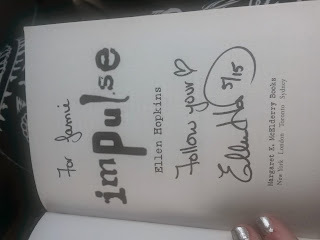 After this, I saw Ellen Hopkins speak because she literally saved my life. I was very depressed and extremely suicidal but reading Impulse helped me battle through, so I was excited to see her speak to see what kinds of things she would have to say. She is very outspoken on social media and I think it is great, she sticks to her convictions and has opinions about things that happen in the world and that is so necessary in this day and age. She talked about her process of writing Crank and how she purposely doesn't give too much detail about how characters look so that the reader can fill in the blanks. She told us about how she went on a school tour where it was a lot of Latino students and when she asked them what Kristina looked like they pointed to themselves. She said that it was one of the best moments because she realized she could reach a large audience. She is so adamant about her books being available in middle grade classrooms (which I would assume is like Grade 6 and up but we don't have middle schools in Canada, so) because this is when youngsters are starting to make choices and decisions that can affect their lives in the future. After this, I went to the last author session of the day and saw Ally Condie speak. She's actually a sweetheart, by the way. She discussed about how she always hated when English teachers would be like "what significance does this colour have in the story?" but she realized as she started writing novels hat colour does place an important part, even if the author doesn't realize it right away. I wanted to ask her a question about Matched series ("What made you decide that Cassia would start to create things in this world when so many other dystopian novels are about destruction?") but there wasn't time during or after her session before the autograph times started. So Ally, if you read this, I would appreciate an answer. After this, I went and stood in line for an hour to get my books signed by Sarah Dessen. Because there was a huge line and wait time, I could only get two signed, so I chose Just Listen and Dreamland, and had the girl in line behind me with only one novel get my second copy of That Summer signed for me (LOVE MEETING NICE PEOPLE). Sarah was a sweetheart and signed my books and took a picture with me. It was so nice to finally meet her. I would have liked to spend a bit more time asking questions and the like, but I didn't want other people to not have a chance to meet her or talk to her. I had to make an executive decision after this because I only had 40 minutes until the end of the day and the end of the signings, so I had to choose between Gayle Forman, Ellen Hopkins, and Ally Condie to meet and get my books signed by. I chose Ellen Hopkins. 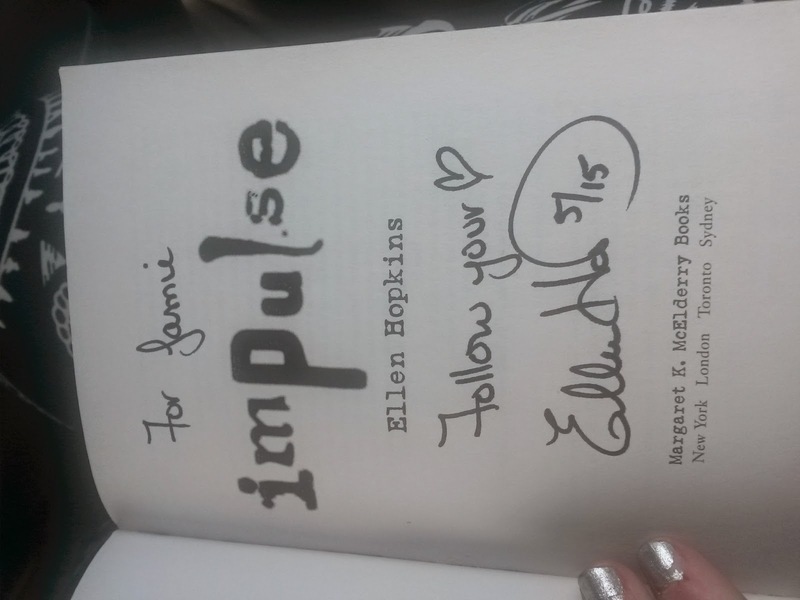 She was really nice and so attentive to everyone and their stories and "thank you"s and I explained why I chose the books I did to get signed (Impulse and Tricks) and that I was really excited for Traffick to come out in the fall. I left after this because it took me too long to get through the Ellen Hopkins line to be able to get in line to meet Ally and ask my question, but that's okay. I will bombard her on twitter or find another tour session to go to. Or maybe she will come back to TBF next year! Or she might read this and answer me! Either way I will find out. Anyway, this was my first year at TBF and definitely not my last, although I would love to see something like this in Toronto, or even somewhere closer to home like Niagara Falls. 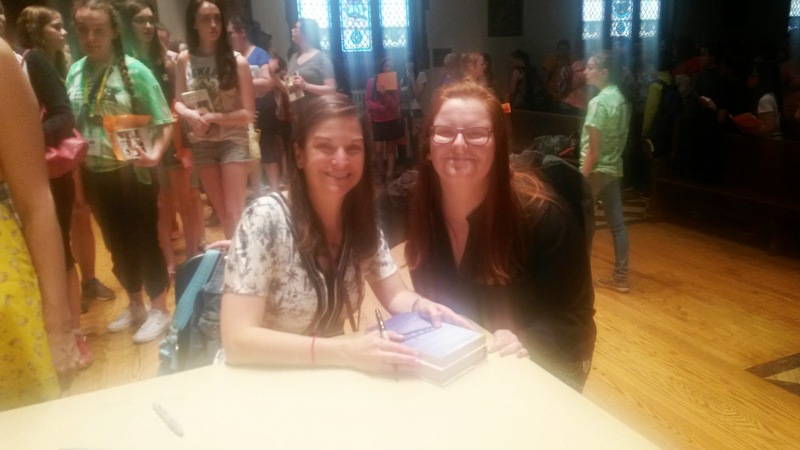 It was such a lovely experience and I couldn't have had it without the sponsors that helped fund TBF and I just want everyone to know that I did not cry when I met Sarah Dessen or Ellen Hopkins even though it was a close call. Until next year I will just have to live with my signatures and pictures! Thanks for letting me know, I will definitely check it out!